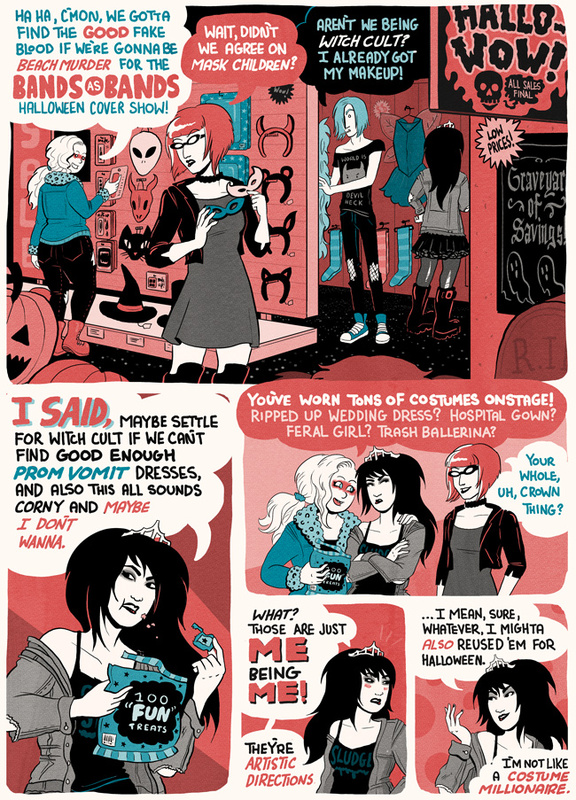 We’re back with a new page, in which: Halloween! I kind of can’t believe I’ve never done a multi-page BVB Halloween story before…and, man, the fact that I probably won’t be able to finish it before the 31st is not going to stop me enjoying drawing Halloween stuff in November. It’s always halloween season in my heart. Sorry for the long wait – I AM back on track with new comics now, and it’s good to be back. Also, in case you missed it: in the meantime, the shop opened again! Turp: looking at a leotard with fairy wings?!? I just like the ideas that: a) There are various grades of fake blood, b) Foxy has tried out a lot of them and so knows which ones are ‘good’.